Unidentified artist, Portrait of Major Patrick Campbell, 1775-1776. Oil on canvas. Friends of Colonial Williamsburg Collections, 2018-26. WILLIAMSBURG, VA.- Likenesses of British officers who served in the Revolutionary War are rare. Therefore, the Colonial Williamsburg Foundations recent acquisition of the first bust-length, British military portrait for its collection is significant especially given the connection of this oil on canvas to events that happened nearby. The subject, Major Patrick Campbell, was a Scottish officer who served in the British lines at the Siege of Yorktown. Until the last few decades, the portrait descended through the family of Major Campbells sister. The portrait of Major Campbell joins Colonial Williamsburgs important collection of militaria pertaining to the Siege and Surrender of Yorktown, which took place approximately 13 miles away. The collection includes maps such as Joseph Frederick Wallet Des Barres A Plan of the Posts of York and Gloucester (1782) and Major General Marquis de Lafayettes manuscript field map used during the Virginia Campaign. Among the paintings are James Peales group portrait of George Washington and his generals after the Surrender and two by French artist Louis-Nicholas Van Blarenberghe after drawings from eyewitnesses to the Siege and Surrender. The collection also features objects relating to other regions where the Revolutionary War occurred. 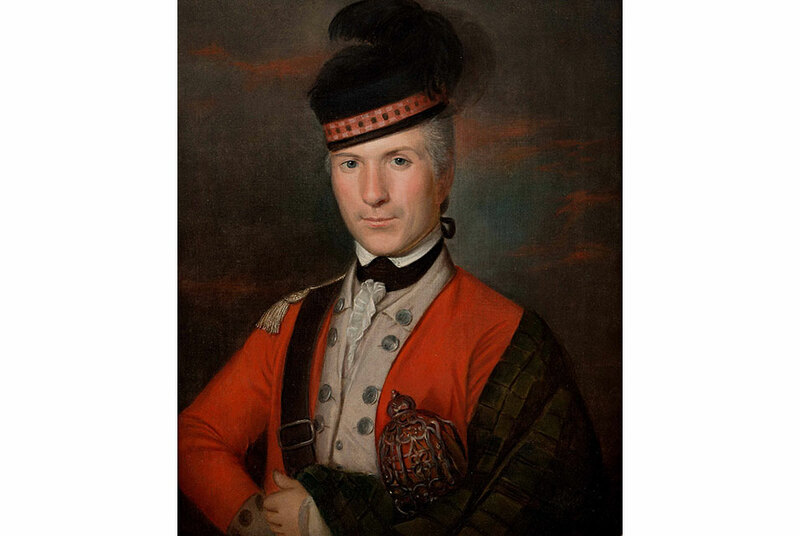 The portrait of Major Campbell was painted in Scotland by an unidentified Scottish artist in late 1775 or early 1776 after Campbell was commissioned into the 71st Regiment to see action in the Revolutionary War. (He also sat for two portraits by John Singleton Copley.) The Major is shown in the uniform of the 71st Regiment prior to receiving command of the Grenadier Company of the 2nd Battalion, at which point a second silver epaulette was added to his uniform. His military career in America was vast: he served in the New York Campaign of 1776, the Philadelphia Campaign of 1777 and sailed to Savannah in late 1778 where he fought in the Campaign of 1779. In December of that year, he was captured aboard a sloop sailing to New York and taken as a prisoner of war to Newport, Rhode Island. He was exchanged back to the British for an American officer of the 2nd Virginia Regiment in 1780. On January 1, 1781, Campbell married Sarah Pearsall, a young woman from a prominent Loyalist Quaker family in New York City, with whom he fathered a son. Major Campbell survived in the British lines at Yorktown in October 1781, where he surrendered as part of the garrison of Redoubt #10, the earthwork fortification in the British defensive line protecting the town. He died in New York City in 1782 and was buried there.